How To Blow Up The World. That's a plain enough title, isn't it? This is a role-playing game about the post-apocalypse genre. The post-apocalypse genre, while it has its roots in older speculative and disaster fiction, is one that has only seen real definition in the last fifty years, after the World Wars and during the Cold War. It is one of the few genres to be created in the last few decades, and it has inspired movies, literature, animation, and comics, and it has seen a recent upswing thanks media-inspired fears of an upcoming apocalypse. Is it going to be North Korea? Islamic terrorists? Home-grown loonies? God's wrathful hand? Or maybe it's just going to be the Commies all over again! While some roleplaying games have covered individual apocalyptic settings, no individual roleplaying game has tried to cover the genre as a whole, doing what Dungeons & Dragons has done for fantasy or Alternity did for science-fiction. 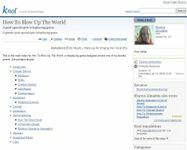 In How To Blow Up The World, we present several scenarios for survivable apocalyptic events, and support in both advice to run them, and rules to play them with. The basis of the How-To rule system assumes a (formerly) real-world setting based on real-world technology, such as in Alas, Babylon and Y: The Last Man. However, it also weaves in support for various types of futuristic and supernatural characters and technology.